This lens is much lighter and smaller than the previous “all-in-one” lens designed by Tamron, the AF 18-270mm F/3.5-6.3 Di II VC LD Aspherical [IF] Macro launched in 2008 (click here for the Nikon mount and here for the Canon mount). The question is if Tamron has succeeded this time in delivering the same or a better IQ on this newer lens. It’s worth noticing that this is the largest zoom available for an SLR camera. Tamron is the only brand that provides a zoom of x15, covering from 27mm equivalent at wide angle to a 405mm equivalent at telephoto. The only lens that comes close is the Sigma 18-250mm F3.5-6.3 DC OS HSM. If you would like to compare them check out the results for the Sigma 18-250mm F3.5-6.3 DC OS HSM mounted on a Canon EOS 7D and on a Nikon D300. 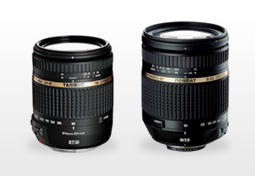 The full lens comparison is available here: Tamron 18-270mm PZD vs Tamron AF 18-270mm [IF] Macro. The results are pretty impressive: This newer version achieves a DxOMark score of 12 versus 8, achieved by its predecessor. On the resolution aspect, the previous version is a bit sharper on short focal, on larger focal, we have the opposite: the new version provides a higher resolution. Vignetting remains very well controlled on the Canon APS-C sensor. Still, some other aspects could have been improved on the new version: the Tamron 18-270mm F/3.5-6.3 Di II VC PZD gives us a slower transmission speed and it has a slightly higher distorsion. When comparing the older and newer version of this lens we have 4 points of difference on the DxOMark Score and an 8 lp/mm loss in resolution metric. The new version is a slightly slower lens. As you will see, every metric is a bit better on the previous (and heavier) model. You can’t always get what you want says the song; if you already have the previous version or you are planning to buy it you will get a noticeably better image quality. Nevertheless this lens is quite heavier than the newer one, if you are on the go and the weight of your gear matters to you, the newer version might be quite interesting. (On a side note: Canon sensors tend to be smaller than the Nikon ones, hence they manage vignetting better, see the comparison of the Tamron 18-270mm F/3.5-6.3 Di II VC PZD Canon vs Tamron 18-270mm F/3.5-6.3 Di II VC PZD Nikon). Which large zoom to pick between these two models for SLR cameras? Their specs and price come very close; the sigma lens though, is a bit older in comparison to the newest version of Tamron. On the DxOMark Score the Tamron 18-270mm PZD is clearly the winner with 4 points of difference, it should be noticeable at 18mm. If you look closer on the DxOMark score map, the results are pretty close on the other measured focal. On resolution, vignetting and chromatic aberration we have a tie. Homogeneity in the field is pretty good on the Tamron version nevertheless the Sigma is quite sharp as well. Vignetting and chromatic aberration should not be a problem for any photographer on these two models. On transmission and distortion: the Sigma lens wins as it is slightly faster and it has better distortion management. In conclusion, the choice remains difficult and it will more or less be a matter of preference. We think most people will prefer the Tamron 18-270mm PZD (Canon mount) as it has a better IQ especially on sharpness, and it is a lighter lens. Tamron 18-270mm PZD vs. Sigma 18-250mm F3.5-6.3 DC OS HSM on Nikon D300s. Here, the Sigma 18-250mm version clearly takes the lead, especially on a resolution point of view.